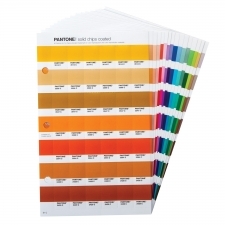 This supplement provides 112 industry-requested, inspiring PANTONE MATCHING SYSTEM Colors in a convenient, removable chip format for those who have just recently purchased a PANTONE SOLID CHIPS Set prior to the new release. Individual chips allow designers optimal color communication flexibility and versatility as they can be easily removed, built into color stories, re-arranged, attached onto design files, presentation and mood boards and then conveniently transported or shipped globally to represent exact color intent. These 112 New PANTONE Colors are market-relevant with emphasis on specific, requested color ranges offering designers the most contemporary and inspirational color options possible for creative design application, expression, communication and specification. The supplement set colors are printed and perforated into removable chips on both coated and uncoated paper. Colors are arranged chromatically to allow for ease in visually locating color families and ranges. If searching for colors by number, users can find an easy-to-read index immediately after the new colors.